John Shinnors was born in Limerick in 1950 and studied painting and drawing under the guidance of Jack Donovan at the Limerick School of Art and Design from 1970 to 1972. Shinnors is one of Irelands leading contemporary painters and has taken part in many exhibitions throughout Ireland. 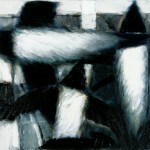 He is represented by Taylor Galleries Dublin and has won several awards for his work. In the 1980’s John Shinnors shifted his interest from traditional representational oil paintings to abstracted works of a reduced palette, mainly in black and white with subtleties of brightly coloured areas seeping through. Certain objects recur throughout his abstract compositions such as lighthouses, scarecrows, kites and skunks creating a distinctive and captivating quality to his works. In 1997 he was subject of Split Image, an RTE television documentary by Michael Garvey. A member of Aosdána, Shinnors has been involved in the promotion of the visual arts in Ireland through the Shinnors Scholarship for an MA in Curatorial Studies with LIT, Limerick School of Art & Design and Limerick City Gallery of Art, and the Shinnors Drawing Award at LCGA. In February 2014 he was awarded an Honourary Fellowship by Limerick School of Art & Design. This entry was posted in Artist Profile and tagged AIB, Bank of Ireland, Boyle Arts Festival, contemporary painters, Crawford Gallery, EIGSE, Graphic Studio Gallery, Irish Museum of Modern Art, Kilkenny Arts Festival, Lavitt Gallery, Limerick City Gallery, Limerick School of Art, Member of Aosdana, National Self Portrait Collection, Office of Public Works, Royal Hibernian Academy, Taylor Gallery, The Hunt Museum Limerick, Ulster Museum, Vangard Gallery. Bookmark the permalink.